13 January 2017. An analysis of data from mobile fitness and health tracking devices shows the devices can yield useful results for monitoring a person’s health, including early alerts to the onset of some diseases. A team from Stanford University’s medical school published its findings in the 12 January issue of the journal PLoS Biology. Researchers led by Stanford geneticist Michael Snyder are seeking practical techniques for evaluating the increasing volume of data generated by mobile devices, such as fitness trackers and smart watches. Not only do these wearable systems generate a steady flow of data in real time, they also connect directly or through smartphones to the cloud, where the data can be stored and analyzed. From these data, the researchers aim to identify actionable indicators for managing a person’s health. 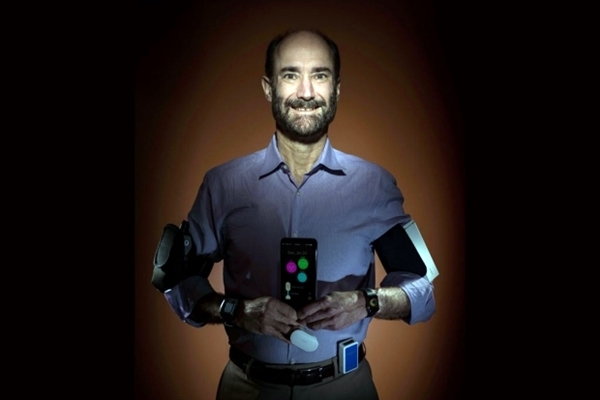 The team started with one participant, a 58 year-old male, who agreed to wear a large number of devices over 24 months to find a smaller, more practical subset of systems to evaluate as well as get a sense of the volume of data they generate. During that time, the individual kept track of daily activities, including a number of airline flights. The person was also examined frequently by clinicians, making it possible to correlate measurements from the devices with medical data. Results from the first participant identified 7 devices considered easy to use, returned accurate results, and allowed for direct access to their raw data. Those data include heart rate, blood oxygen saturation, skin temperature, weight, gamma and x-ray radiation exposure, and 7 activity measures: sleep, steps, walking, biking, running, calories, and acceleration forces caused by movement. Together the 7 devices generate some 250,000 measurements each day. The team then expanded the sample to 18 individuals age 28 to 72, who measured changes in blood oxygen saturation in airline flights, and 43 people, 35 to 70, wearing a Basis fitness band for up to 11 months. (The company recalled Basis Peak smart watches in September 2016 for overheating.) In recruiting this larger group, the team sought out individuals with risk factors for type 2 diabetes, where the results would highlight measures for diagnosing disease. As a result, 12 of the 43 participants were found to have insulin resistance, an indicator of prediabetes. The researchers collected nearly 1.8 million readings from more than 7,200 devices. Algorithms were written to analyze the mass of data and correlate the findings to clinical lab tests. Among the results were a strong correlation between lower blood oxygen saturation on long airline flights and fatigue, attributed to the lower oxygen pressure in airline cabins. For most people, however, their bodies adjust to the lower cabin pressure and fatigue dissipates. The team also found some physiological and activity readings from the devices could spot insulin-resistance. Measurements such as the difference between daytime and nighttime heart rate and daily number of steps were found to discriminate between insulin-resistant and insulin-sensitive individuals. In addition, researchers found in several participants a correlation between higher than normal measures of heart rate and skin temperature, and increased levels of C reactive protein in their blood. Elevated C reactive protein levels are early indicators of inflammation from infection or other causes, including autoimmune or cardiovascular disorders. For Snyder, the study has a personal angle. He was one of the participants in the research wearing the 7 fitness devices, and after a flight to Norway he found his blood oxygen saturation levels did not return to normal as they had done before. He later developed a fever and other symptoms of illness, which he thought may be due to Lyme disease from a tick bite two weeks earlier in rural Massachusetts. Treatment with antibiotics in Norway helped relieve some of the symptoms, but a later diagnosis showed evidence of the Lyme bacteria. The team foresees where fitness and health trackers make it possible for individuals to track their baseline health measures, while big data analytics highlight outliers or unusual patterns indicating the onset of health problems. The authors say a patent for detecting disease from data in these devices is being prepared.